Hi, this is bug fix stable Rom for LeEco Le Max 2 . this is a New Marshmallow update LeEco Le Max 2 EUI 5.8.019S Stable Stock Rom and here is an easy and safe tutorial for install or New Marshmallow update LeEco Le Max 2 EUI 5.8.019S Stable Stock Rom. LeEco Le Max 2 has Brilliant 5.7 inch screen with 1440 x 2560 pixels resolution. This phone comes with superb build quality and innovative design. LeEco Le Max 2 has two outstanding features Qualcomm MSM8996 Snapdragon 820 and Adreno 530 GPU with eUI 5.8, it’s make this phone very smoother and faster. 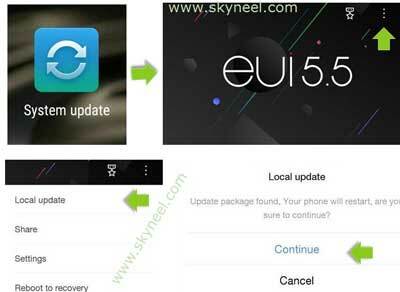 You can fix some issue by this update LeEco Le Max 2 EUI 5.8.019S Stable Stock Rom. This is an Android 6.0 Marshmallow update, it is a marshmallow update with some fixes. Fixed an issue in which call drop happens when making VoLTE calls using Reliance JIO 4G network and Fixed an issue in which Reliance JIO Sim can not register IMS. Enhanced the auto night mode camera. Fixed an issue in which fingerprint unlock fails after few captures with camera from locker screen. Fixed an issue in which fingerprint unlock fails after few captures with camera from locker screen, Optimized color spot under HRD mode and Optimized QR Scanner focus speed. Step 1: Download LeEco Le Max 2 EUI 5.8.019S file and rename this zip file as “update.zip” like LE_X2_X820-OS-OP-FGXOSOP5801910121S-5.8.019S.zip to New Marshmallow update.zip. Step 3: Go to “System update App” from the system tool, tap on the setting icon, it is a 3 dots icon on top right corner (see in this image) and tap on the “Local update” tab. Now you can see a message on your phone Screen, ” update package found, your phone will restart, are you sure to continue?”. See in this image. After New Marshmallow update LeEco Le Max 2 EUI 5.8.019S Stable Stock Rom, you can root your phone because root allows you to use a maximum of your phone without any restrictions. After root you will install custom apps, Rom and custom setting in your phone. But first read Root Advantage and Disadvantage by this article then follow this guide to root LeEco Le Max 2. I hope you like this New Marshmallow update LeEco Le Max 2 EUI 5.8.019S Stable Stock Rom installation guide from which you will be able to easily install or New Marshmallow update LeEco Le Max 2 EUI 5.8.019S Stable Stock Rom without any extra efforts. If feel any problem in this guide then please use comment box. Thanks to all. Hi Now this is working. As link is not working please upload the (India) stock rom eui 5.8.019S for Letv Le Max 2. In this post stock rom link is given of official letv forum. May be this forum is not working or they removed this link from it. Soon I will upload stock rom and provide it you . In this post stock rom link is given of official letv forum. May be this forum is not working or they removed this link from it. Soon I will upload stock rom and provide it you. Please give new update link. My phone has 5.6.013s and it donent have any uptate in the updater app. I am unable to use calling . Your help will be grate. Thanks in advance. I thought of returning the phone back to Flipkart because It was shipped with 15s and I couldn’t use Jio SIM. Thanks to your article, I downloaded and tried updating the 19s stock ROM. Bit it failed. I had an instinct that I should have first updated to 16s stock ROM. I did it and it worked. Then I tried updating 19s stock ROM. It worked and I am able to use Jio SIM. Thank you once again. hii bro im Arfath., i also purchased le max 2 from flipkart recently, shipped with 5.8.015s. i have a doubt after updating to 16s can we directly update to 19s which is showing in system update or again we should download the 19s through link??? plzzzzz help me bro waiting for ur reply eagerly…..